Problem: As frictional horsepower increases on any street rod, fuel consumption will increase. What are some good methods used to reduce frictional horsepower in a typical street rod to improve the vehicle mileage? Solution: Frictional horsepower, defined as horsepower used to overcome friction as the street rod moves forward, includes friction from tires, air flow over the vehicle, friction produced because of extra weight, friction from the differential, U joints, transmission, engine, belts, alternator, AC compressor, etc. One of the best ways to reduce frictional horsepower is by using radial tires. There is less rolling resistance with radial tires as compared to old type four-ply tires. Another way to reduce frictional horsepower is to make sure the front and rear wheels are aligned correctly and to specifications. 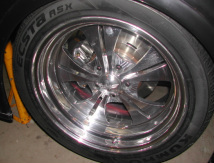 If the wheel alignment is out of specifications, the wheels may have more rolling resistance. The end result is more frictional horsepower. Also, always try to reduce the weight being carried in the street rod. Never carry anything you don’t need. Make sure the brake pads or shoes are also adjusted correctly so that they don’t produce friction as the wheels are turning when the brakes are not being applied. Being aware of the causes of frictional horsepower can help determine what changes can be made to reduce it.